The very first day of Goddess Saraswati Puja at the time of Navratri festival is popularly celebrated as ‘Saraswati Avahan’. The term Avahan denotes invocation and thus the ritual of Saraswati Avahan is performed for invoking the divine blessings of Goddess Saraswati. The concluding three days of the grand festival of Navratri are primarily dedicated for worshipping Saraswati Maa. The ritual of Saraswati Avahan is performed on the seventh day (Maha Saptami) in the month of Ashwin during Shukla Paksha as per the Hindu calendar. According to the Gregorian calendar, the is being observed in the month of October or November. What is shubh muhurt for Saraswati Avahan? Check the Choghadiya to know the auspicious timings of the day. How do we observe Saraswati Avahan? The ritual of Saraswati Avahan is observed at the fortunate and auspicious Mula Nakshatra Muhurat. The total time duration for the Puja is approximately five hours. But the time usually varies from year to year. While performing Saraswati Avahan, there is a need to recite special Mantras to invoke the blessings of Goddess Saraswati. With the chanting of the Mantras, the devotees please Goddess Saraswati and seek her guidance and protection in the form of her blessings. One of the most vital aspects of Puja is the ritual of washing the Goddess’ feet. A ‘Sankalp’ or vow is then taken by the devotees. The devotees decorate the idol of Goddess Saraswati with Chandan (sandalwood paste) and Kumkum and such custom is called as ‘Alankaram’. The devotees also offer flowers and incense sticks to the deity. On the eve of Saraswati Avahan, a special meal is prepared in the form of ‘Naivedyam’ and is offered to Goddess Saraswati. White is regarded as the most favorite color of the deity, so, all the sweets and savories are prepared accordingly. Once the puja is concluded, the sacred prasad or the Naivedyam is distributed among all the devotees who have gathered. Some of the devotees also observe a fast on the eve of Saraswati Avahan. What is the significance of Saraswati Avahan? 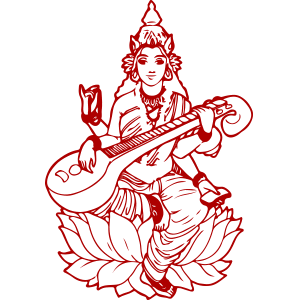 According to Hindu Vedic sacred texts, Goddess Saraswati is recognized for helping Lord Brahma, Shiva, and Vishnu in the creation and maintenance of this Universe. Goddess Saraswati is additionally known by the names of Sharada, Mahavidya Nila Saraswati, Vidyadayini, Sharadamba, Veenapani, and Pustak Dharini. 'Saraswati Avahan' is a two-letter word, where Saraswati is Goddess Saraswati and avahan means summoning. Subsequently, Goddess Saraswati, the Goddess of learning and knowledge is summoned by the devotees on this favorable day. Lord Brahma created the universe with the knowledge of Goddess Saraswati only. There is no achievement in life conceivable without learning and insight. Goddess Saraswati is summoned and worshipped devotedly in the last three days of Navratri. The main day of summoning Goddess Saraswati is called Saraswati Avahan. The devotees worship the Goddess with utmost dedication and zeal. To seek wisdom and immense knowledge, the devotees worship Goddess Saraswati and observe the ritual of Saraswati Avahan. In Hinduism, Jainism as well as Buddhism, Goddess Saraswati is worshiped with immense devotion as she is the Goddess which blesses her devotees with supreme knowledge and also supports in conserving the sacred teachings of Gautam Buddha.